A makeshift memorial stands outside the Tree of Life synagogue in the aftermath of a deadly shooting at the in Pittsburgh, Oct. 29, 2018. Pittsburgh’s Tree of Life synagogue was a gun-free zone until an anti-Semite with guns turned it into a sea of death. After offering condolences, President Donald Trump said that “if” the synagogue had armed guards, the outcome “might” have been different. The usual critics blasted Trump for blaming the victims. I’m no fan of Trump, but I’m also no fan of demonizing. He was speculating, not blaming. And he may have a point. It’s fair to have a discussion about armed security in houses of worship, a continuation of the unfinished discussion of armed guards in schools. But to have that conversation, we must leave our biases at the door. The liberal Matthews couldn’t even imagine it. If armed guards are unimaginable to Matthews and to those who think as he does, why do we have them at airports, in Congress, and in banks? More than 40 percent of U.S. schools have armed guards, at least part of the time. So can we have the discussion? Let’s start with this: Those fighting the expansion of good-guy guns into our society are locking a barn that the horse left long ago. Would they endorse removing guards from sanctuaries that have them? Synagogues are loath to discuss their security arrangements. 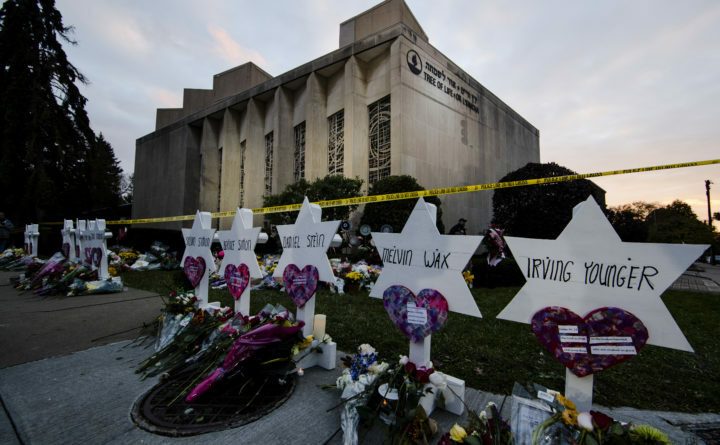 Laura Frank, spokesperson for the Jewish Federation of Greater Philadelphia, told me it’s unlikely that any have “full-time armed guards.” However, many either ask local police for help during High Holy Days or hire private security, she said. Philadelphia police declined to discuss what kind of security is provided to houses of worship and under what circumstances. At an interfaith service Sunday evening at Rodeph Shalom on North Broad Street near Mount Vernon, one congregant saw at least a dozen police, including “some inside the sanctuary, and I have never seen that before,” he told me. Rabbi Bob Alper, who used to lead a congregation in Glenside before moving to Vermont, is also a stand-up comedian who plays about 25 dates a year, often in synagogues. “Half the time there’s a guard or two, particularly in Florida,” he told me. On visits to the 150-year-old Central Synagogue in New York, he’s noticed “police cars, sometimes one, sometimes more, in the front,” and plainclothes police inside. You may not like the idea of cops and guns in a house of worship. Who does? The reality is that among our 325 million Americans, a handful are dangerous, are murderous, and want to hurt us. We can’t pretend that wanting peace from those burning with hate will get us peace. The Pittsburgh mayor, who seems to be a good soul, bemoans having guards in synagogues. He fears that America might become an armed camp. I’d prefer an armed camp to an abattoir where worshipers become victims. Stu Bykofsky is a columnist for the Philadelphia Inquirer.